Whitby Town defender Andrew May has come out of Jamie Vardy’s V9 Academy with promotion firmly on his mind. May spent a week at Vardy’s academy with over 40 other non-league stars, based at Manchester City’s Etihad Stadium, allowing a number of pro clubs to cast their eye over him. And Rio, as he is better known to Town fans, found the experience an enjoyable one. “It was a great week,” May told the Whitby Gazette. “We were split up into three teams over week and the squad I was in suited me down to the ground. “We played from the back so it was ideal for me. That’s how I’ve always played. “It was similar to how Chris Hardy likes to play at Whitby. That made it easier for me. 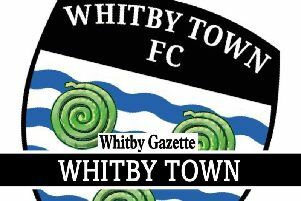 “Now I’m coming out of that with more experience back to Whitby and promotion has to be the aim. “We were so close last season but just missed out, disappointingly. Also at the academy was fellow Blues star David Carson, though May admits that he didn’t see much of his colleague. “I was in a different team to Davey, so I didn’t really see much of him. “He was in a side that beat Bangor City 3-0 so they must have been decent.